In The Love of Neighbour in Ancient Judaism, Kengo Akiyama traces the development of the mainstay of early Jewish and Christian ethics: "Love your neighbour." Akiyama examines several Second Temple Jewish texts in great detail and demonstrates a diverse range of uses and applications that opposes a simplistic and evolutionary trajectory often associated with the development of the "greatest commandment" tradition. The monograph presents surprisingly complex interpretative developments in Second Temple Judaism uncovering just how early interpreters grappled with the questions of what it means to love and who should be considered as their neighbour. DETAILS MATTER: Why Is Esau’s Kiss Dotted? (Prof. Albert I. Baumgarten, TheTorah.com). Those are old dots. Origen seems to have known about them in the third century. LARRY HURTADO: More on Carbon-14 Dating of Manuscripts. This post focuses on C-14 "plateaus," something I don't recall encountering before. Carbon-14 dating is a useful tool, to be used alongside other tools such as paleography and archaeological stratigraphy. But like all tools, it has its limitations. It is not a magic bullet. Some past PaleoJudaica posts on C-14 dating are collected here. TECHNOLOGY WATCH: Northwestern Students Explore Water Technology in Israel (Karyn Simpson, Northwestern University). They explored ancient, modern, and future water technologies. Did a giant meteor destroy Sodom and Gomorrah? I WAS EXPECTING AN EARTH-SHATTERING KABOOM: Evidence of Sodom? Meteor blast cause of biblical destruction, say scientists. Multi-disciplinary team of scientists uses 3,700-year-old archaeological evidence from Jordan’s Tall el-Hammam Excavation Project to understand end to civilization near Dead Sea (Amanda Borschel-Dan, Times of Israel). Could be. The Bible certainly knows a tradition of a fiery destruction of the region in antiquity — antiquity for the biblical writers, not just us. That could be a distant memory of this meteoric event. Or it could just be a story. Let's see how this develops. GENIZA FRAGMENTS, the Newsletter of the Taylor-Schechter Genizah Research Unit, Cambridge University Library has published its October 2018 Issue. Some topics are: a handover of the Lewis-Gibson Collection to the Bodleian Libraries; using calendar fragments to establish paleographic dating; "shorthand Bibles"; and new books on poets and poetry. Michael L. Satlow (ed. ), Strength to Strength: Essays in Honor of Shaye J. D. Cohen (Brown Judaic Studies 363; Brown University, 2018). Follow the link for TOC and ordering information. And congratulations to Professor Cohen! OLD CHURCH SLAVONIC WATCH: Roman Basilica holds exhibit on one thousand years of Roman Rite in Slavonic language (Rome Reports).The exhibition, "To God, in our own language," is in the Basilica of St. Mary Major and is sponsored by the Croatian embassy to the Holy See. Not surprisingly, St. Cyril is featured. In related news, at wrti9.1, Susan Lewis asks: How Often Do You Hear a Mass in Old Church Slavonic? Now's your chance. For past PaleoJudaica posts on (Old) Church Slavonic, with explanation of why we're interested, see here and here and follow the links. BIBLE HISTORY DAILY: A Biblical Spice Rack. Herbs and spices of the ancient Near East (Devorah Emmet Wigoder). In ancient times, herbs—the edible leaves, blossoms and soft stems of annuals and perennials—were used primarily as medicine. According to the apocryphal Book of Jubilees,1 angels revealed to Noah all the illnesses of the world and their remedies so that he could “heal by means of the herbs of the earth” (Jubilees 10:12). Noah diligently recorded the cures in a book. Below, I, like Noah, record the herbs and spices of the Near East throughout history. Also, timely, in light of an announcement last week at the ASOR conference (at the same time as AAR/SBL): Residue found in 3,600-year-old Holy Land tomb rewrites the history of vanilla. World’s 2nd most expensive spice was thought to have been introduced 13,000 miles away and thousand of years later, until analysis of burial offerings at Canaanite tomb in Megiddo (Amanda Borschel-Dan, Times of Israel). It seems that traces of vanilla extract have been found at Megiddo, dating to c. 1600 BCE. Vanilla is not mentioned in the Bible, but now it seems that it may have been in use in the region even before the Israelite period. I have already blogged on Meggido Tomb 50 and its impressive assemblage of organic remains. VARIANT READINGS: National Geographic’s “Bible Hunters”: Some Observations. This National Geographic article does not seem to be online, and I haven't seen the print version, but Brent Nongbri (and Larry Hurtado by link) present some highlights from it. UPDATE (28 November): For the article online, see here. NORTHWEST SEMITIC EPIGRAPHY WATCH: Colloque : 150e anniversaire de la découverte de la stèle de Mésha (THE MESHA STELE 150 Years After the Discovery). On 29 November 2018. Le Centre de recherche français à Jérusalem est heureux de vous inviter à un colloque célébrant le 150e anniversaire de la découverte de la stèle de Mésha. Publiée par Charles Clermont-Ganneau, alors en poste au consulat de France à Jérusalem, cette stèle est l’une des plus grandes découvertes archéologiques en rapport avec la Bible. Pour l’occasion, nous avons invité Isabel Bonora, du Musée du Louvre, qui relatera l’extraordinaire histoire de la découverte de cette stèle et de sa reconstruction au Louvre, où elle est aujourd’hui exposée. André Lemaire, de l’EPHE-Sorbonne, fera ensuite le point sur les questions de déchiffrement et d’interprétation qui restent d’actualité 150 ans après la découverte. Dans une seconde partie, Shmuel Ahituv et Matthew Morgenstern reviendront sur des aspects épigraphiques et linguistiques, tandis que Michael Langlois évoquera le problème des contrefaçons nées à l’occasion de la découverte de cette stèle et qui perdurent jusqu’à aujourd’hui. Nous vous donnons rendez-vous le jeudi 29 novembre à 14h. As you might guess, the papers are in French. Follow the link for venue details and the program. I'm glad someone is taking notice of this anniversary. Past PaleoJudaica posts on the Mesha Stele/Moabite Stone are here and links. Source criticism of a dream? On his way to Haran, Jacob stops at a place, later named Beth-El, and sees in a dream angels going up and down a staircase to the gateway of heaven. In the story, Jacob also notices Yhwh standing beside him and and Yhwh speaks to him. Examined closely, this short story is beset with literary difficulties that suggest it is composed of two independent narratives. Many years ago, when I was a doctoral student, I went through the Hebrew of the Pentateuch verse-by-verse to decide whether I thought that the Documentary Hypothesis worked. I decided that it more or less does. I was less convinced of the distinction between J (the Yahwist) and E (the Elohist) than that P and D were separate traditions. But J and E usually did seem to work well in the book of Genesis. I haven't revisited the question since in any detail, so I don't know what I would think now. All that leading up to saying that this is an interesting essay, but this story in Genesis 28 doesn't strike me as the most convincing example of the case for J and E as originally separate narratives. Much of the argument involves finding inconsistencies in a dream narrative. My dreams are pretty internally inconsistent. I bet yours are too. And sometimes I dream that I'm doing something and still know that I'm asleep dreaming. The story of Jacob's dream seems to me to be skillfully crafted to read like an actual dream. The narrative may well still be a combination of J and E but, in my opinion, this particular example doesn't provide a very strong argument for the source division. HAPPY THANKSGIVING to my American readers and to anyone else who is celebrating! This is a normal work day in the United Kingdom, so I'm here in my office as usual. Besides, I'm on research leave, so what better way to spend the day? But I'll be celebrating a little this evening. TEMPLE MOUNT WATCH: Artifact from First Temple period unearthed in Jerusalem. 'Beka' counting weight for census with ancient Hebrew script found in soil removed from Western Wall foundations (Arutz Sheva). A "beka" weight is equivalent to the half-shekel coin. This weight, however, was from the First-Temple period, before there were coins. It would perhaps have been used to weigh the half-shekel Temple tax. It is inscribed in mirror script, which is arguably an informative error. ARCHAEOLOGY: Israel dig provides clues on how feasting became an important ritual. Evidence from a 12,000-year-old archaeological site in country’s north shows communally shared meals have long been vital components of human ceremony (Natalie Munro, Times of Israel). This research is considerably more substantial than my cheeky header implies. I have commented further on it here. This article, by one of the excavators, summarizes the story about the grave of the Neolithic female "shaman" (?) found in Israel. It also puts the story into a wider anthropological and archaeological context. It looks as though feasting together has always been important to human beings. THE HOLY LAND PHOTOS' BLOG: First Century Synagogue at Magdala — Did Jesus Worship Here? (Carl Rasmussen). Timely, given the recent publication of Richard Bauckham's book, Magdala of Galilee. MISAPPREHENSION: Middle East Looters Turn to Spirit Possession to Find Gold Treasure (Owen Jarus, Live Science). As "antique" gold coins from the Middle East pour into the United States, some looters are turning to spirits called "jinn" in their hunt for gold treasure. A few gold seekers even go so far as to try to get the jinn to possess them in hopes that the spirits will guide them to that hidden jackpot. Mr. Jarus even infiltrated a social media group of jinn-assisted looters. (Yes, that is a thing.) Shockingly, and despite many stories in the Thousand and One Nights, it doesn't seem to work. DECORATIVE ART: Newly revealed 5th century mosaics a kaleidoscope of Jewish and secular imagery. Archaeologist Jodi Magness started to excavate the Galilean village of Huqoq to put to rest a decades-old academic debate. Then she found mosaics and the site just keeps on giving (Amanda Borschel-Dan, Times of Israel). This article covers the Huqoq mosaics, but also discusses the Huqoq excavation more generally. An interview with Prof. Jodi Magness, the chief excavator, gives the background on how and why she chose the site. Background on the Huqoq excavation and its mosaics is here and many links. And since we also like to keep track of the archaeology of Pompeii, let's note that a new mythologicaly-themed fresco has just been discovered there: Sensual fresco of queen and swan discovered in ancient Pompeii bedroom. Archaeologists say the figure of Leda being impregnated by Jupiter in bird form was a fairly common home decoration theme in town destroyed by Mount Vesuvius eruption in A.D. 79 (AP). THIS WEEK'S DAF YOMI COLUMN BY ADAM KIRSCH IN TABLET: The Showbread Must Go On. In this week’s ‘Daf Yomi,’ the Talmud is ‘a kind of speculative historical fiction’ about Temple rituals. My contributor's copy arrived yesterday. Congratulations again to Professor Boccaccini on this very well-deserved honor! I was sorry to miss the SBL reception for his Festschrift, but I am not at the SBL meetings this year. THE ETC BLOG: Bible as Notepad (Peter Malik). This is the title of a new book edited by Liv Ingeborg Lied and Marilena Maniaci, published by De Gruyter. Follow the link for TOC and discussion. I was at the Bible as Notepad Conference in 2014, but I didn't publish a paper in this volume. THE LOGOS ACADEMIC BLOG: Design Showcase: The LXX Reader’s Edition (Tavis Bohlinger ). A very informative interview with William Ross, co-editor of Septuaginta: A Reader’s Edition, just published by Hendrickson. In the following interview with William Ross, we discuss the creation of the Reader, technical aspects of the design, and what’s in store for LXX studies in the future. If you’re in Denver right now for ETS/SBL, now’s the time to get your copies. PROFESSOR LAWRENCE H. SCHIFFMAN: BUYER BEWARE! 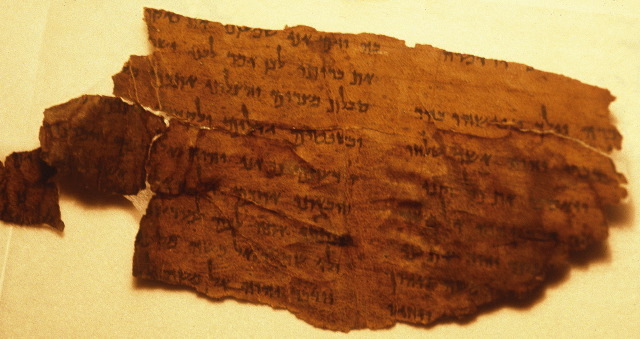 HOW FORGED DEAD SEA SCROLLS WERE EXPOSED BY HIGH-TECH TESTS. Reprint of a recent article in Ami Magazine. NOW COMPLETE: Robert Alter’s epic, literary one-man Bible (David A.M. Wilensky, The Jewish News of Northern California). The article reports that full three-volume translation will be published in December. PaleoJudaica has been following its progress for many years. For relevant posts, run "Robert Alter" through the blog search engine. THE AWOL BLOG: Newly added to Orbis Biblicus et Orientalis Online, 13-15 November 2018. I appreciated Chuck Jones keeping a list of these. There are currently 301 free volumes online. Many are of interest for the study of ancient Judaism. DECORATIVE ART: Stunning biblical mosaics revealed in detail for the first time (James Rogers, Fox News). For the first time, archaeologists have released detailed images of stunning biblical mosaics discovered at the site of an ancient synagogue site in Northern Israel. The mosaics depict Noah’s Ark, the parting of the Red Sea, Jonah and the fish and the Tower of Babel, according to researchers at the University of North Carolina at Chapel Hill. Portions of the mosaics have been revealed before, but this is the first time the artifacts have been shown in their full glory. Background on the Huqoq synagogue mosaics is here and many links. BRYN MAYR CLASSICAL REVIEW: Jennifer A. Cromwell, Recording Village Life: A Coptic Scribe in Early Islamic Egypt. New texts from ancient cultures. Ann Arbor: University of Michigan Press, 2017. Pp. xxiv, 287. ISBN 9780472130481. $90.00. ISBN 9780472123117. ebook. Reviewed by Alain Delattre, Université libre de Bruxelles (ULB)​ (Alain.Delattre@ulb.ac.be). This is the revised version of Jennifer Cromwell’s PhD dissertation (Liverpool 2008). The author originally aimed at studying and reediting the corpus of Djeme papyri (P.KRU). The enormity of the task led her to focus on the texts drawn up by a specific scribe, Aristophanes, son of John, who lived in Western Thebes during the first half of the 8th century.1 Not only did the author explore Aristophanes’ scribal practices, but she also considered people and procedures involved in the documents. This original perspective allows her to draw an interesting portrait of the society of a village in the early Islamic period and to offer a stimulating study on a scribe’s life and practices. THE JEWISH REVIEW OF BOOKS: Black Fire on White Fire (Adam Kirsch). In The Jewish Bible, Stern masterfully synthesizes this scholarship, offering a chronological history of Jewish sacred books from Qumran to the JPS Tanakh. For if the Sefer Torah itself hasn’t changed, other ways Jews encounter their scripture definitely have. Indeed, as Stern shows, the Jewish book serves as a lens through which we can study central themes of Jewish history and thought. Adam Kirsh also has an ongoing Daf Yomi column at Tablet Magazine. The current issue of JJMJS, the first in its new form, offers a Special Issue on Paul, which we have entitled Paul, Judaism, and the Jewish People. Contributors include: Margaret M. Mitchell, Matthew Thiessen, Paula Fredriksen, James Crossley, Neil Elliott, Adele Reinhartz, Matthew Novenson, and Gregory Tatum, with an introduction by the undersigned [chief editor Anders Runesson]. The issue considers in particular the impact of the work of E.P. Sanders forty years after the publication of his magisterial Paul and Palestinian Judaism, but also includes discussion of the very latest research in Pauline Studies. There are more details at the link, as well as the full text of the current, free, open-access Issue 5 (2018)﻿﻿. PaleoJudaica noted the lauching of the journal back at the beginning of 2016.